You are here: Home / Cutting Costs / Are Money Saving Measures Creating Travel Nightmares for Your Employees? Many business associates are finding that the cost saving measures their company is implementing are actually creating travel nightmares for them. While the company may save $100 on a flight, the employee may be forced to fly at odd hours. The company may save $35, but the employee is forced to stuff his clothing (suit and tie included) into a carry on bag. If your company is looking to save money while traveling, there are several tips that will deliver without sacrificing the employee’s comfort. First off, search for airlines (JetBlue and Southwest) that do not charge extra for one piece of checked luggage. Each airline has its set pricing chart for the first checked bag and each subsequent bag. Try to book with airlines that charge the least amount for luggage (Airtran charges $15 while U.S. Airways charges $25). Be sure to read the weight and size limits. Some airlines are charging as much as $75 for bags over 50 pounds. Most airlines do not accept luggage over 70 pounds. Be sure to follow your specific airline’s guidelines when packing to prevent expensive charges. If you know your travel dates in advance, book as early as possible. If you wait until the last minute, you risk not getting a flight or paying higher airfare. Remember, the cheapest airfare is not usually available within 3-4 weeks from the flight. Search online for the cheapest rates. If you are flexible with your travel dates, you may find that just moving up your travel one day can greatly alter your costs. Also, check for prices at surrounding airports. You may save a great deal of money by flying into one airport and simply driving a little further to your destination. Many online search engines have “flexible” searching in which you can search for surrounding airports and flexible dates. If you are flying internationally, be sure that your paperwork and passport are up to date. If you have to expedite a passport, you will pay overnight postage fees (both ways) and a $60 fee. To prevent delays and costly fees, always keep your paperwork up to date. As with your airline, do an online search for the cheapest hotel prices. Some airlines may offer a bundle including airfare, hotel stays, and even a rental car. 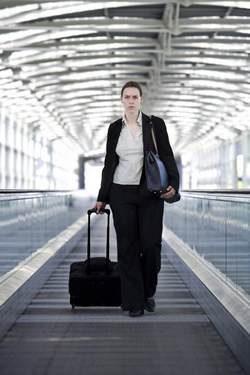 Most business travelers require free unlimited high speed internet access. Be sure to confirm that your hotel has this to prevent paying high WiFi fees. If you do not need unlimited access, many hotels offer free internet usage in their lobby area. Book early and ask your hotel to honor a lowest rate policy. If the price drops, you will see a refund. Choose a hotel that has a mini refrigerator and kitchen area. You can visit the local grocery store and find easy meals to make on your own. Purchase some snacks that you can take with during the day. This will save a great deal of money lost to expensive, restaurant meals. If your hotel offers a free continental breakfast, be sure to use it. Avoid room service, which is often over-priced. And, most importantly, don’t empty the refrigerator’s contents to store leftovers. Many times you are automatically charged once the beverage is lifted off the shelf. Avoid purchasing unnecessary extras, such as a GPS. If you are a frequent traveler, it would be wise to invest in your own personal GPS. Fill up the car yourself rather than request advanced fill up. Although this may not work in every city, you may be able to use public transportation such as a bus, shuttle, or subway. You will avoid paying parking costs and also limit the amount of driving you must do. There are many ways that you can save money on your next business trip, without eliminating comfort. Often the key is to plan in advance, be flexible, and do price comparisons for every single thing.